Recently, clients have been reprising questions to us regarding many things. These are some common questions answered. 1. Is Purnima Exports an Indian Company ? A. Yes, Purnima Exports is an Indian sole proprietorship 100% export company run by Purnima Bansal. We are registered with various trade organisations and have a valid Import Export Licence for exporting goods internationally. 2. Where is Purnima Exports head office located ? A. Our Registered Address is Maharani Bagh, New Delhi – 110065. We started our company from this place initially and then moved to a Industrial Area in Okhla and have partner units. 4. Do you Export to other countries ? A. We are 100% Export House. We ship globally. 5. What is your minimum order Quantity ? A. We will work with minimums as low as 10 per size, style and color. We are proud to offer some of the lowest minimum order quantities in the industry, and are passionate about helping new designers start their brands successfully. You can choose your preferred quantity always. We would be glad to entertain you for every single or big quantity you order. We are already working with Small Retailers, Designers, Wholesalers who started initially with small quantities. 6. We want to reproduce a garment with my own specification and sizes. Can you make the garment ? A. Yes positively send us across the sample with your changes in it. Or simply send us your sketches and pictures. 7. Do you do Private labelling ? A. Yes, We are supply garments with buyer own custom labelling. We are the most prestigious name in full service private label apparel manufacturers from India that provides A to Z solution starting from concept to production as well as delivery and dispatch across the globe. We work based on your custom design and specification you provide to us which helps to yield 100% matching your requirement. 8. Can you send me your catalogue ? A. We will send you our company Profile. We will also send you a small catalogue to show you the type of work we do. We can share our New Development. But we cannot share with you the designs of other designers we are working with. which we keep upto us. 9. Do you Participate in International Trade Fairs ? A. We participate in Trade Fairs and Exhibitions. We will update you. Join our mailing list. 10. I am a Designer and want to Develop My Line of Clothing. Could you Help . I don’t want my designs to be copied. A. Yes, We are working with designers developing their embroidery and creations. Our Company policy is that we do not showcase our customer designs to other designer. 11. How Can I work with you ? A. We are in touch with most of our clients via emails, Phone, G Talk, Skype. Mobile apps such as Viber and Whatsapp. 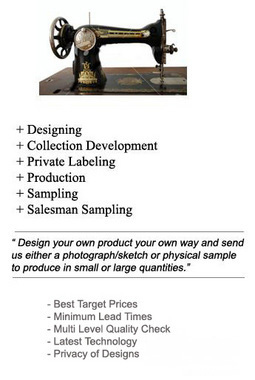 We send you detailed photos of your design as soon as they are completed via emails. When you need to see the actual samples, we use international courier express direct to you in 3 days. 12. If I do work with you, can I have the fabric sent directly to you ? A. When you have placed an order, fabric can be sent directly to us and we can store it until we cut and sew it. This is very common. However, since many fabrics originates from Asia itself, our long distance buyers always gives samples of their desired fabric and we buy for them at our location only. This is very cost effective practice always. 13. Can you provide me your price list ? 14. I am looking for a wholesaler to buy ready stock for my Fashion Clothing boutique, can i see your collection ? A. We are not a fashion wholesaler, We do not carry any seasonal collection or any stock We’re a “Made-to-Order” private label clothing manufacturer and produce as per given style and quantity instruction from our clients. We make fresh collection to be sent to our clients. Also our company Policy does not allow one client’s style to others. 15. What are your Minimums ? A. It totally depends on type of garment you are ordering. We work with all type of quantities. 16. Why Do you think your company is successful? A. We’re very flexible to needs of clients. We have been working from over 20 years in clothing line. So have good sourcing capability and understand the quality that client needs. At different occasion we have worked with designers and produced there whole collection which also included items which we did not do before. 17. Can you give me a price quote by email? A. Nope! We can only give a price quote once we have your pattern, tech pack, and fabric in hand and create a production sample for you. This is our most frequently asked question. As is standard in the industry, we can never provide a price quote by phone or email. If you do not have a pattern we can create a pattern for you, but we won’t be able to give you a price quote on your garment until your pattern and production sample is finalized. But we could provide you an estimate. 18. What is your lead time? If you have any questions. Just drop us a mail using the query form.